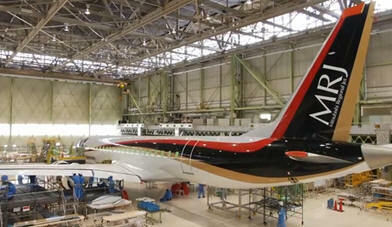 December 24, 2015 – Mitsubishi Aircraft Corporation today announced that the company will change the first delivery schedule of the MRJ (Mitsubishi Regional Jet), their next-generation regional jet, from the second quarter of 2017 to the second quarter of 2018. Flight tests have confirmed some problems with insufficient wing strength and a need to redesign the landing gear. "We .. have recognized several issues as we attempt to accelerate our development. In order to tackle these issues and address the perspectives .. we have reviewed and revised our overall schedule. The Mitsubishi Regional Jet (MJR) is a twin-engine regional commercial aircraft that will have a seating capacity of 70 to 90 passengers. The MJR will be Japan's first built airline passenger aircraft since the NAMC YS-11 (Nihon Aircraft Manufacturing Corporation) turboprop airliner which was built in the 1960's. The MJR will complete against Canada’s aircraft manufacturer, Bombardier for its regional aircraft market. In 2010, MJR entered into its production drawing phase and on November 11th of this year made its maiden flight. The MJR has had several setbacks, its first flight was to take place in the 2nd quarter of 2012, but it was delayed to 2014. The company also reported it would make its first delivery of the aircraft in 2014, but had to revise that plan to 2016 and today the company reports its first delivery has been pushed up to 2018. Back in 2012, SkyWest Airlines entered into an agreement with Mitsubishi Aircraft to purchase 100 Mitsubishi Regional Jets, with an option to purchase an additional 100 aircraft, but it has been reported that deal has been canceled. " We remain firmly committed to providing our customers with better-integrated aircraft with higher levels of safety and reliability, as well as high-quality services."